A tour of Diu is not complete without visiting the magnificent St. Paul’s Church. It was built in 1600 A.D. by the Jusuits as seminary and was subsequently rebuilt in 1807 A.D. The church dedicated to Our Lady of Immaculate Conception. 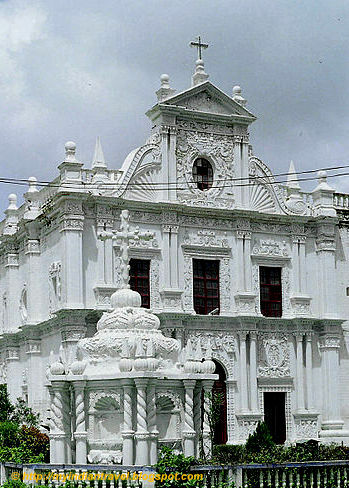 The most attractive part of the the church is its impressive Gothic facade considered to be the most elaborate of any of the Portuguese churches of India. The front elevation or facade of the church is very detailed. 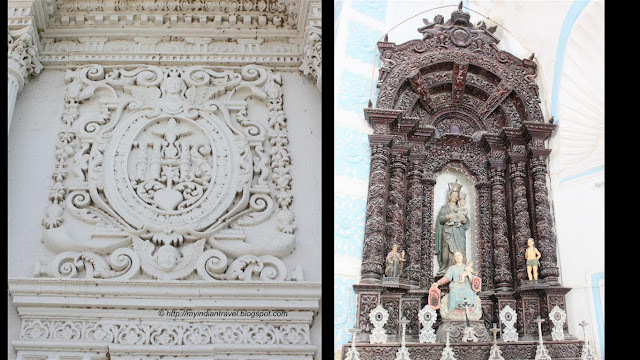 The interior of the church is decorated with intricately carved very beautiful wood work. The altar has the statue of St. Mary. carved out of a single piece of Burmese teak Its interior has elaborate and impressive design with delicate volutes and shell. Very intricate and beautiful. I have never visited Diu, I think I must fir this in, during my next trip to Mumbai. That is a wonderful church, great shots. What a wonderful church. I love the first picture and the interior. You are so lucky to go to see it. Very ancient but looking very beautiful ! !